I know some of you are waiting to hear my reactions to a replacement Kindle Fire HD 8.9″ 4G LTE Wireless 32GB I received last night. It is a replacement because, as explained in this earlier post, the first one I received had power issues (the screen would flicker, turn off, and it wouldn’t start up properly). I’m giving you first impressions here, and there will undoubtedly be an emotional component to it. This is the first Kindle (and I’ve had them back since 2007’s first generation Kindle) that I am considering returning as unsatisfactory. Part of that, honestly, is that I irrationally expect it to work smoothly at $499. I say irrational, because a $69 Kindle should also work as expected…not have the same capabilities of a $499 model, but they both should perform the basic functions expected of them well. First, let me say that this one does not at all have the problems that the other one did. There has been no flickering: the screen stays lit beautifully. It is a beautiful screen, by the way: it looks very good. Looking at the home screen is like looking at a glossy picture in a magazine, to my eyes. The first big problem is the power button. It’s extraordinarily hard to push. I say extraordinarily, because I also have the 7″ Kindle Fire HD, which has a similar button. It took me a bit to find that button on the first model, but that’s not what is happening here. It is literally hard to get it to recognize that I”ve pushed it. It’s sort of like trying to push a thumb tack into wood. People without reasonable finger strength simply couldn’t do it. That’s not how it was on the first one: that was easy to push. This is a significant inconvenience. I’m hoping, however, that it “loosens up” in the next couple of days. If it does, I won’t return it for that. I’m lucky that I have a cover that automatically puts it to sleep, though. Second, I’m paying $200 more for 4G, and the set up isn’t working. I’m sure that’s because of the unusual circumstance of having returned one after having bought a plan on it. I want that plan to apply to the new one, and it might, but I can’t figure out what options to choose. It now shows that I have two devices on the plan, but the new one doesn’t have a data plan. It asks me if I want to switch to a “postpaid plan”. Prepaid makes sense to me, but I don’t know what they mean by postpaid. I tried to figure it out based on the information available to me on the device, but I”m going to have to call AT&T and have them walk me through it. While it’s possible that I’m unusually ignorant on dataplans, I think I can reasonably say that this would not be obvious to many consumers who buy a Kindle Fire 4G. I generally understand technical instructions well. I can often read a legal document (like copyright law) and have it make sense. I’m a former banker (although that was some time ago). 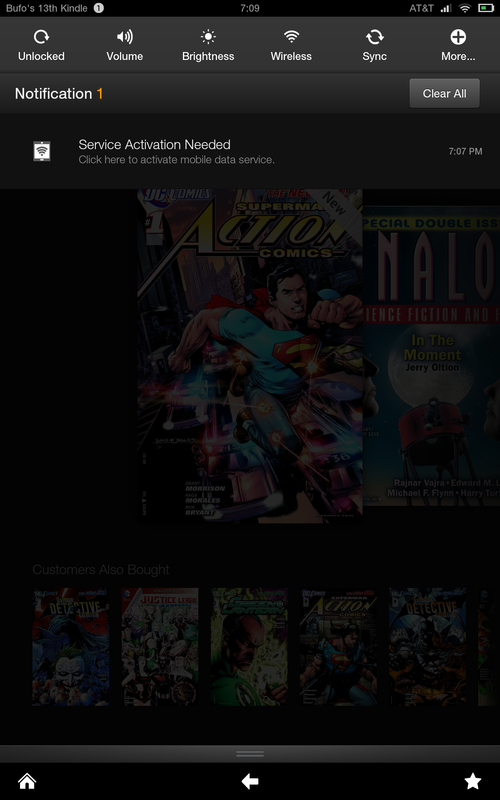 Hopefully, the call to AT&T will be as pleasant as a call to Kindle Support is, but that is a high bar to meet. Third, and someone asked me to test this, the sound on my 8.9″ is not as good as the sound on my 7″, which is surprising to me. I took them both out of their covers, and played the same song on both. No question, the sound on the 7″ is certainly richer (I’d also say it is louder, but that’s a bit harder to call…”richer” is subjective, “louder” is objective, and I don’t have a good way to measure it). I checked my volume settings, and tried it with Dolby both on and off: same result. Prime video looks good on the device. When I ran a Netflix video at first it didn’t look good. When I ran it this morning, it looks great. It may have updated the app. Oh, and this one did perform a general update of the software last night. It’s at version 8.1.3. I’m trying to answer questions people have asked, so in response to another one: the 8.9″ has both Ivona text-to-speech and Pico text-to-speech on it, which is the same with the 7″. The Ivona TTS, which is really good, is what is invoked by the Kindle reading app on it. This was a weird thing: one of the apps I consider to be very important, ES File Explorer, wasn’t available for me to download from my archives/Cloud, so I assumed it wasn’t released yet in a compatible version for the 8.9″. I went to the Amazon Appstore, and there it was, and it was compatible (and didn’t tell me I had bought it previously). I checked both versions they have in the Amazon Appstore, and neither one seems to be the one I had gotten earlier…even though I have that one on my other devices. Again, I think a lot of people would find that confusing. I’m going to keep testing it out today, and a lot may depend on how the call to AT&T goes. 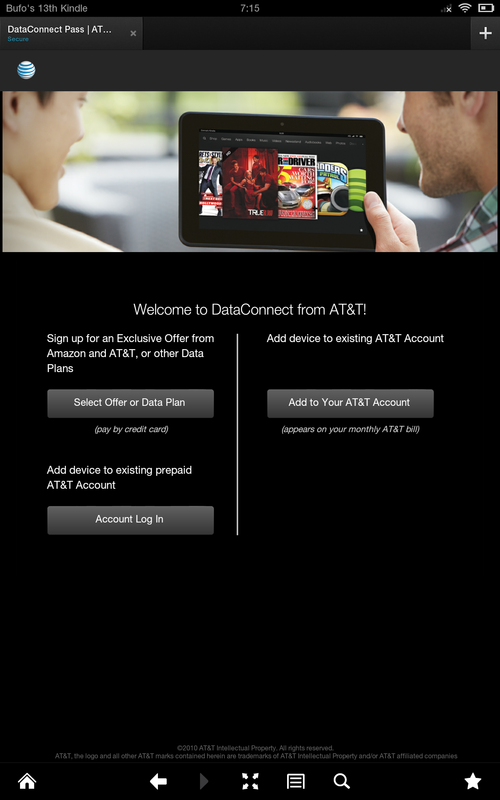 By the way, I asked somebody yesterday at an AT&T kiosk if I could use the 250MB a month dataplan on two devices (I was just curious at that point). One person emphatically said yes, and the other person looked shocked at the answer. 🙂 I’ll ask them about that as well. That could save people some real money…if they aren’t going to use much data and can pay $49.99 for the first year for two devices, that would be good. Well, I’ll check back in with you on this later. With my experience up to this point, I wouldn’t be recommending the device to others in my personal circle yet, like I enthusiastically do with other Kindles. Update: the AT&T folks were very nice, almost effusively so. Everybody wished me a happy day, weekend, holiday…pretty much everything, and thanked me repeatedly for using AT&T. It took half an hour and three people to resolve the issue. The first person didn’t understand the situation very well, which is probably because I used the “mobile” option for a topic. I wasn’t sure what to use…later on, they used “session based services”, but I’m not sure how they got me to a tablet person. The first one wanted to discuss voice and texting, which doesn’t apply. The second person got me to the third person. The fix was to give me a credit for the $49.99 I’d already spent, and then have me sign up again on the new device. 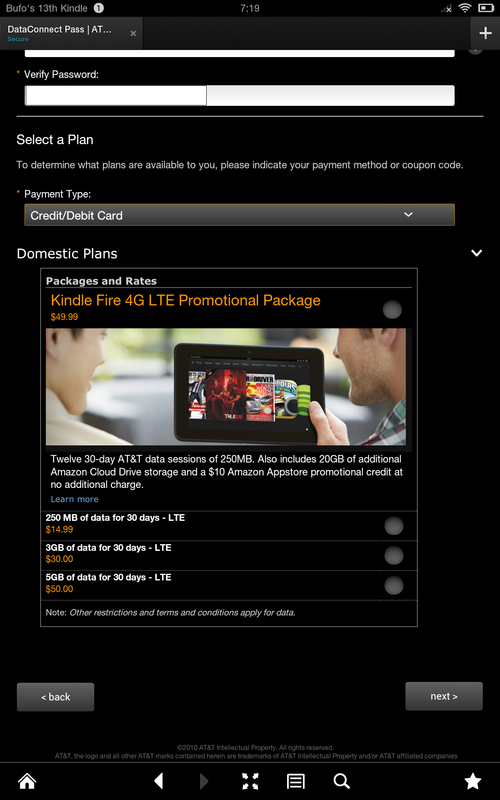 I got a definitive answer: you can’t use the $49.99 plan on two or more devices. I’ve now tested the video through an HDMI (High Definition Multimedia Interface) cable to my TV: it looks good, much better than my 7″. That’s a plus. I tried Prime streaming and through the Netflix app. At this point, I’ll keep it, test it on the road (for the 4G element), and hope the power button loosens up and becomes more responsive. Update: I’ve been using it for most of a day, and the power button is loosening up…yay! While on the road, the 4G connected smoothly. I’ll have to look at the idea of dropping the data on my phone (I’d keep voice and text). Not sure how much that would save. I need to run some more tests on the sound…some comments have made me think it might have been the source material. In December, the KOLL pool pay will get a $700,000 bonus on top of $700,000 ($1.4m for December, as I had reported). Not only that, but an additional $8m will be added, split between January and February of 2013. January is a huge shopping month, traditionally because of returns, but also now because of giftcards received (although those may be spent in December to some extent). How does the “pool pay” work? Publishers have a share of the pool pay for each time a book of theirs is borrowed. Let’s say that my book The Mind Boggles: A Unique Book of Quotations, is borrowed one hundred times in December. If there are a total of 100,000 borrows that month, I would get 1,000th of the pool pay, or $1,400. That’s regardless of how much it costs for a consumer to buy the book. A ninety-nine cent book like The Mind Boggles gets just as much of a share as a $9.99 book. I’ve written before about how this changes the economics, certainly of book pricing. KDP Select books have been purchased, borrowed from the Kindle Owners’ Lending Library, or downloaded for free through KDP Select promotions over 200 million times. Notice how they phrase that. They say (I think correctly) that being in the KOLL increases the number of times your book is bought. They are getting that shockingly large 200 million figure including the number of times a book which is in the KOLL is acquired outside of the KOLL. A book like The Hunger Games is going to raise that number, no question, but most of the books in the KOLL are nowhere near that high profile (however, they also may not account for as many borrows). They are careful to keep saying “global”…the KOLL is now available outside of the USA in some countries, which should increase the number of borrows, which reduces the value of a share. I still think it can be a great program, although I know some are skeptical of having to have their books available exclusively through Amazon to participate. that their Android appstore is now available in Japan. Amazon boldly refers to their “global expansion” in the press release. I’m always a bit…intrigued, I guess is the best word, when people post in the forum that Amazon is ignoring their country, with the implication that it’s deliberate. You have to be able to do it in a way that makes sense, though, and it can be complicated to get the proper systems in place. Amazon is, I am positive, not cavalierly choosing not to sell somewhere, or negligently ignoring a market, or making some political statement. If they can make it work, I think they will. Making it work includes making the local deals for content, support, and delivery that are necessary. Interestingly, I didn’t find a way to actually see the apps there, just a way to install the appstore and promotion for it (including promotion to developers). (and I’ve seen it a bunch of other places, too), Amazon is, in another bid for world distribution 😉 taking its traditional publishing operations to Europe next year. I really think that if the Agency Model hadn’t come along, Amazon wouldn’t be this deep into traditional publishing by now. Yes, they might have eventually done it, but basically, the publishers wouldn’t let Amazon do what has been the traditional role of a retailer (getting product from distributors and then pricing it as it sees fit for consumers). That forced Amazon, in a way, to shake up the model, and is seeing them take over the role the publishers have had. Certainly, there are challenges for Amazon in this. Some brick-and-mortar stores refuse to sell books published by Amazon (at least in their stores…see my impassioned advice to bookstores, as a former bookstore manager myself). That makes it more difficult for the print side to succeed, currently. We’ll see how that all plays out, of course. The article also reproduces an alleged letter from Amazon to literary agents which outlines some changes in Amazon publishing, including personnel shifts. One thing that stood out to me there: Amazon’s Children Publishing. Tablets like the Kindle Fire line can be a wonderful platform for children’s books, which have always been gadgety (colorful illustrations, pop-up books, Pat the Bunny, and so on). Desire for a specific children’s book can also be really strong…after all, if you are going to read something a hundred times at bedtime, it better be something the adults like, too. 😉 Kids love repetition: you don’t need a wide variety of books for a four-year old (although it’s fun), so each book is a bigger buying decision. If Amazon has a book your kid has to have, that’s a big strength for it. What do you think? Did publishers have no choice but to adopt the Agency Model to combat Amazon’s discounting of the prices consumers pay? Does Amazon make decisions about where to sell for other than business reasons? What can tradpubs do to thrive? Are tablets the wrong way for little kids to experience books? Feel free to let me and my readers know what you think by commenting on this post. Amazon touts the great sales for Kindles and related products over the Black Friday – Cyber Monday weekend. which was their best Cyber Monday sale item ever, according to the release. Yesterday was the biggest sales day that Kindles have had so far…and the market is still in a big growth phase, in my opinion. last night when they predicted I would. They said by 8:00 at night…it came at about 7:00. Setting up was as easy as is to be expected, and that is very easy. I turned the power on, entered my password to connect to my wi-fi (I would have been allowed to skip that), confirmed I was me, and that was it. It showed me a demo screen for how to do things, similar to what I’d seen on the 7″. My Carousel was populated, and by default, I did see recommendations at the bottom (“Customers Also Bought”, now sometimes abbreviated as CAB). It had 37% battery charge life when I got it. I swiped down, and saw this for Service Activation Needed (although it was already showing me AT&T as an icon near my battery icon). Okay, I want to be careful about this next part. My experience here may be quite atypical…I don’t think there are a lot of these 4G models out there yet, but I’ll be interested to hear what happens with other people. It quickly became the most frustrating experience I’ve had using a new Kindle. The screen kept flickering on and off (I had it both in and out of the case). The lighting on the screen actually looked irregular near one short edge…sort of like the Kindle Paperwhite. The flickering was at a level that was clearly unacceptable. It wouldn’t wake up without the power button being used twice. The first time, it would only go to a gray screen…no image. Clearly, it seemed like a power issue, so I decided I would charge it overnight. This morning, I was still having problems. At that point, I copied the screenshots I had taken for this post (just like with the Kindle Fire 7″, you can hold the power button and the lower volume button ((the one towards the center of the screen)) at the same time and get a screenshot which is stored in Pictures…and it’s a nice animation so you know it has happened) to my desktop, and did a factory reset. Yes, that meant it automatically deregistered it, and that I’d have to download content and set up my wi-fi again. I wanted to try that early, before I had much on it. It seems to be fine this morning so far. Calling Kindle Support has never been an unpleasant experience for me, but I didn’t want to have to send it back (even though they make it as easy as possible). I’ll have to try it for a day or so and see if the problem recurs, and if it does, I’ll contact them. The screen is gorgeous: I can tell the difference between this one and the 7″ (this one has more pixels per inch: 1920 x 1200 versus 1280 x 800). It’s pretty comfortable to hold…it doesn’t feel that much heavier than the 7″, interesting, although I haven’t held it for a long session. It is 6.1 ounces heavier). The Carousel showed about 20 items when I started, and I believed it is cumulatively adding things as I open them. Oh, another problem at first…even after I downloaded items, it wouldn’t open them, telling me there was a problem with the DRM (Digital Rights Management). Restarting the device took care of that. Downloading seemed slow before the reset to factory defaults…now it seems fine. I like the look of the bigger screen! I’ll have to see how it is to carry it around with me compared to the 7″. The screen seems super responsive to the touch…maybe even too much. 🙂 In landscape mode, the keyboard is big enough for me to actually type, although I don’t quite have the hang of that. I’ll have to try my Bluetooth keyboard with it. The keyboard is also different from the 7″. It has an icon of a scissors on the ABC/?123 button (the one that switches you from letters to numbers. Holding that down gives me a bunch of editing tools, including ones for copy and paste. I found it a little confusing at first. You have to use the T with the square around it to select the text, then you can copy. Drat! The issue with the screen is still there! It’s easy to identify it now…just setting it lightly down on something causes it to flicker. Plugging in the USB cable causes it to happen. It appears to me to possibly be a loose connection in the power system, a loose battery or something. I’m going to contact Kindle Support for what I presume will be a replacement. I would have guessed they could see that as easily as I could. For those of you who don’t know about the returns, you contact them and if return is the right answer (it isn’t always), they e-mail you a link to a return label. You print it out, take it to a UPS store, and that’s it. You do not need to send the defective one back before you get the new one. The one big recommendation I have for you: keep the original packaging material for thirty days at least after you get it…that makes it easy to box it up for return, if necessary. Update: I went through all of the one star reviews on this model on Amazon…nobody else mentioned this problem, so hopefully, mine was a fluke. I could just say that it’s the Monday after Thanksgiving, of course, but that Friday is Black Friday, which is a huge shopping day in brick-and-mortar stores. Cyber Monday originally came about because people didn’t have high speed internet in their homes…so they waited until they got to work on Monday to do their real online shopping. That’s just not the case any more…that issue about high speed. It’s true for some people, I’m sure, but many people have internet access which is as good or not better at home than they do at work. Eventually, I think people will want those “Cyber Monday” deals the same day they shop in the physical stores…why not? You don’t want to buy something in a brick and mortar on Friday, and then see it cheaper on Monday online. Stores that sell both online and in person would like to preserve the separation…but I just don’t think that’ll happen. The splash ad for me on the front page was the Kindle Fire SD (the Kindle Fire 2nd generation which is not HD ((High Definition)) but SD ((Standard Definition))) is $30 off…today only. That’s right, you can get the newer model of the original $199 Kindle Fire for only $129! Show me another business besides tech where you get an item for 65% a year later…that does more. That’s a great deal! If you need a gift in the next couple of months, this is probably a good bet. Oh, and it applies with or without Special Deals, by the way…$30 off. What if you aren’t in the market for a tablet, and just want a good deal on an e-book? There are some wonderful books there! They’ve decided to price their banner deal books (at least the first few) at $2.02 (rather than $1.99), which as a former retailer I can tell you is a fascinating decision. They are breaking the “even dollar” barrier…not sure what the thought was behind that. Maybe $2.02 evokes the year, 2012? Maybe they just think making three cents more apiece is worth it, if the mental block against evens is broken by the Cyber Monday concept? There will be Cyber Monday deals in related categories, too…music and video, for example. If you see something particularly good that you think my readers should know about, feel free to comment on this post. One thing: always check the price. Some of these deals may expire, and they may not apply in your country. includes one which I’m guessing won’t last. It’s a free coupon for 30% off select Kindle accessories, value up to $30. If you haven’t joined AmazonLocal (which is free), this one is a good excuse to do it. You may need to get something for someone who already has a Kindle, or a new cover to go along with one you are buying. I’d jump on this one…can’t hurt. Is non-fiction more important than fiction for students? by Sara Mosle in the New York Times. To meet this standard, a student should be reading 70% non-fiction in school, and 30% fiction. “Myth: English teachers will be asked to teach science and social studies reading materials. I think what they are trying to do is not reduce the amount of fiction being used, but increase the amount of narrative non-fiction. They specifically say that English Arts teachers don’t need to be using non-fiction. However, the 70/30 split suggests that reading non-fiction is more important than reading fiction, and the article indicates that is done to better prepare students for the work world. First, I like non-fiction, and read it a lot…and yes, I did that in elementary school and up through high school (the standards cover K-12…Kindergarten through 12th grade) as well. Gerald Durrell, for example, was just as interesting a read to me as any fiction. While reading non-fiction has certainly helped me at work, I have to say…reading fiction helped me just as much. There are few job where having an understanding of people isn’t a plus, and that’s what reading is at its heart: perceiving things through another person (the author). I’m a much better employee (and person) for having read Doc Savage, and for that matter, having watched The Lone Ranger. Presuming that non-fiction somehow better prepares people for being at work seems like a fundamental misunderstanding of how people interact in organizations, in my opinion. Normal adults are motivated first by social standing when they are at work. Will people make their best suggestions if making a suggestion gets the boss angry at them? Not often, and not often with good consequences. I would love kids to read narrative non-fiction along with science textbooks, certainly. Textbooks often strip as much subjectivity out of their contents as they can…which absolutely justified, but makes it harder to engage students. Narrative non-fiction doesn’t do that. Read Carl Sagan or Jared Diamond or Nate Silver…those are not dry recitations of facts, and the opinions of the authors are clear. You don’t have to agree with them to find it engaging. I also have to say: how often do you get to read narrative non-fiction at work? What we get at work is often a lot more like those textbooks…stripped down to facts and figures. I’ve had a great boss who encouraged people to tell stories about what was happening at work in meetings…and that was a valuable tool! I’m a little concerned that the easiest way for schools to meet this standard will be to reduce the amount of time spent on English. Let’s say that a student is reading, oh, five hundred pages a year of fiction in school. The science teacher, who hasn’t really been assigning narrative non-fiction, comes up with a book that is two hundred pages to teach. Preparing the lesson plan and such will make a two hundred page book a considerable commitment. With the 70/30 ratio, how many fiction pages does a student get to read if all they get in narrative non-fiction is that two hundred page book? About eighty-six pages. Want to maintain those 500 pages of fiction (which isn’t much over the course of a school year, depending on the grade)? Assign about 1,230 pages of narrative non-fiction…along with the lab work and so on. It would seem more logical to me to say that a certain percentage of the time spent in non-English classes be spent reading narrative non-fiction. Why base the amount of narrative non-fiction on the amount of fiction? I’ve just been accepting as a postulate here that K-12 should be designed to prepare you for college and for the work world…there could be a hearty discussion around that as well. What do you think? Should the amount of fiction that gets assigned in K-12 be based on the amount of narrative non-fiction that is assigned? How valuable is fiction to a student? Should elementary and high schools be just about preparing people for work and college? Do you think the best employees with whom you’ve worked have been fiction readers, non-fiction readers, non-readers, or a mix? One of the coolest things about being a Kindleer is that Amazon doesn’t limit the number of devices (both hardware Kindles and reader apps) that we can have registered to our accounts. If you want to do so, you could get a hundred friends and neighbors (or coworkers, or students, and so on) registered to the same account. You could all read the same Kindle book…for one licensing fee! Tech writers often seem to miss this, and when people complain that they can’t share Kindle books, I’m reasonably sure they aren’t aware of this (although sometimes, they may want to lend books to people not on their accounts, which is different from sharing…the latter means equal access). You can’t usually all read them at the same time, if you have a hundred people. Each title has a number of “simultaneous device licenses”, which is how many device on the account are allowed to have a license for the device (typically, have downloaded it) at the same time. Unless it says otherwise on the book’s Amazon product page, that number is six. Some titles have fewer licenses; some are unlimited. We have four people (and more than ten devices) in two time zones on our account. However, managing all that can get messy. When you “buy a book” from the Kindle store (you really buy a license), you choose a device to which it should be downloaded first. If you are buying it from your device, it goes to that device. If you are buying it on a computer, it defaults to the first hardware Kindle listed alphabetically. After that, you can get the title to another device on the account one of two ways. To do that, you need to know the username and password for the account, or at least be on a computer logged into the account. The other way is from the device itself. That varies a bit by model. Often, from the homescreen, you use the menu, and choose archives or Cloud. On a Fire, you may see the books in the Carousel, or you may go to Books and tap Cloud. If you are trying to send a book to a several devices out of, let’s say, ten, that’s clunky. I do think Amazon is going to considerably improve this, possibly in the next year. They already have Whipsercast for organizations, and I think we’ll get some version of that. Here’s what I’d like to see. A device can be grouped under more than one person. A person can have more than one device. A group might be something like “The Kids”, which could include multiple people and/or devices. Obviously, this would need to be easy to do. 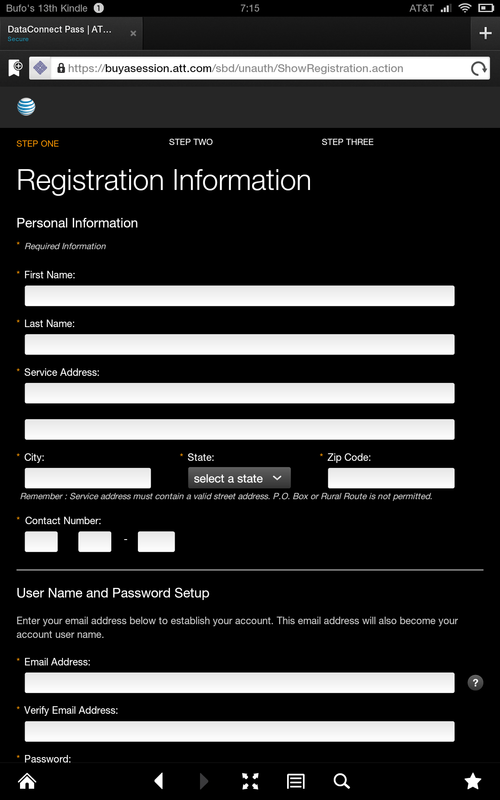 One approach would be to have profiles that you assign to a person/device/group. A “Manager” profile might be able to do all of the above. A “protected user” profile might only get the content specified for it, while a “general user” might be able to download books from the archives, but not buy new ones or delete. I picture these definitions as being managed at that Manage Your Kindle page, but then showing up when a new device is registered (“Whose device is this?” with a dropdown). When you bought a book from a computer, you’d get a choice of the people/devices/groups you defined…and whether it should be sent now or not. I think the default would be however you defined it (“Send to Bufo’s Kindle Fire first”). Amazon certainly isn’t about restricting the number of devices you buy or trying to have you have more than one account…the Kindle FreeTime app shows that. Once they did have this set up, who would want to move to another company? If you’ve created profiles for one hundred people, you don’t want to have to recreate them if you moved your enterprise (or whatever group it was) to Barnes & Noble. This is all just a basic proposal: are there are specific powers you think profiles should have? Do you think this is something Amazon will do (or something like it)? How important would it be to you? Feel free to let me and my readers know by commenting on this post. A couple of times recently, we’ve gotten e-mails from relatives that have pictures as attachments. I tend to be checking my e-mail more often than my Significant Other, and sometimes we are both in the family room and I’d like to share the picture. Well, it’s a little awkward to hand the Kindle Fire across the ottoman. for a very low $39.99. That’s $20 off, and Amazon is giving a $5 credit for Amazon Instant Video purchases. That deal is only good through Monday, and I only know it works in the USA. The Roku is good for a lot of things, but here”s how the picture thing works. I installed the free Juice channel on my Roku (like everything else on the Roku, that’s easy). Then I get an e-mail with an attachment. I open the attachment in the included e-mail app on my Fire, and it asks me if I want to open it with Juice (along with some other options). I have the Juice channel up on the TV, and that’s it…the picture displays very nicely on the TV! We can both see the picture in detail, which is very convenient. My Kindle Fire HD 8.9″ 4G LTE Wireless 32GB still isn’t shown as shipping, and is expected on Monday. I did buy a cheap case (currently $10.23) for it, though, and that got here today. Obviously, I can’t really test it out yet, but I did try one thing. I’ve mentioned before that I wear a photojournalist’s vest when I’m not at work…and think of it like Doc Savage’s “utility vest” (which preceded Batman’s “utility belt”). I tested it out: the case fits inside the pocket where I normally carry my Kindle! That’s great! It was a tight fit, but that is certainly the easiest way for me to carry it around. which I had purchased previously. That intrigues me! What makes it similar? How do they know? It seems weird to me that it would be published by Thomas & Mercer (thrillers and mysteries) rather than 47North (science fiction and fantasy). “Similarity” is definitely a tricky thing in marketing. They didn’t tell me that “people who bought also bought” which can presumably be done through autonomous software pattern checking. Does software determine what is similar for them? It could, but this is probably a human’s judgement. Amazon teases their Cyber Monday sales (this Monday, 11/26, is “Cyber Monday”. That’s the Monday after Black Friday ((which is in turn the Friday after Thanksgiving)). The old idea was that people waited until they got back to their office’s high-speed internet to shop online. While that’s probably not true any more, the tradition continues. In a Black Friday deal for Amazon.co.uk, the Kindle Fire SD (Standard Defition…also know in the USA as the Kindle Fire 2nd Generation) is only £99.00, which is a £30 savings. That’s quite a deal! They haven’t done that in the USA, although it’s possible they’ll do something on Cyber Monday (not likely, though, I think…we’ll see). I mentioned hooking up my Kindle Fire HD to our TV, and having the image look a bit “muddy”. I played with the setting on the TV, and got it to look a lot better! I turned down the color saturation, and set a lot of things to the middle value. It was entirely watchable that way, although not as sharp and fluid as the TV’s normal high definition programming. I want to try it with more videos…I may not have been using a high-definition video as a test. These were mostly from my personal experiences…found anything cool on your Kindle (Fire or reflective screen) you’d like to share with my readers? You can do by commenting on this post. In the USA (where I live), today is Thanksgiving. I thought I’d mention some of the things in the world of e-books and Kindles for which I’m thankful this year. Of course, outside of that, there are many thinks for which I’m truly grateful (including my family and my job), and I tend to generally think things are good. However, narrowing down the focus will make for a better and more useful post for you. 😉 I hope you all have things for which you are thankful, and if you don’t, that you will soon. I could keep going, but I want to make sure I thank you, the readers (and especially the subscribers). You not only make all of this possible for me, but you make it so much more valuable. You are, honestly the main reason I do this…I love to hear from you, to learn from you, and to just know you are out there. Best to you and yours today and throughout the year!